When I went to Brussels Midi station to buy a return ticket to Bruges, the cute guy at the counter looked at me rather surprised and asked, ” You want to come back the same day,” I smiled and told him that I had no choice. 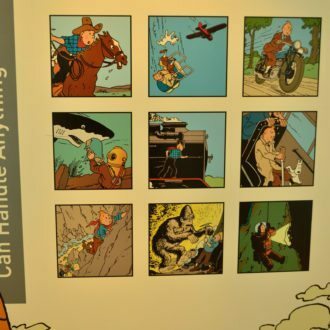 In fact I did not even have the time to visit Ghent as I had to return to Brussels. But I still managed to experience Bruges at my own pace by not rushing “to do” everything. 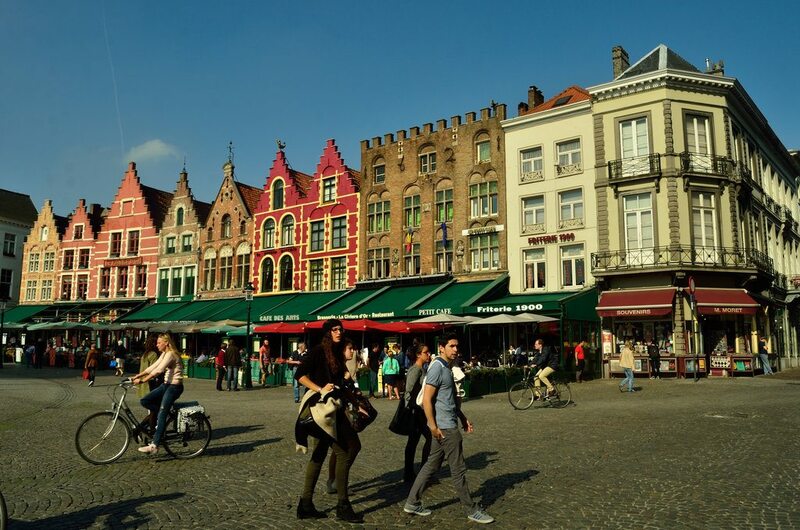 It also helped that Bruges is a small town and I had great company, a fellow Indian, Vaidehi Satish, from Madras (Chennai) who was on the train with me. And the town was an absolute delight, doing justice to every known superlative adjective from the guide books. However here are my ten reasons why I recommend it strongly . 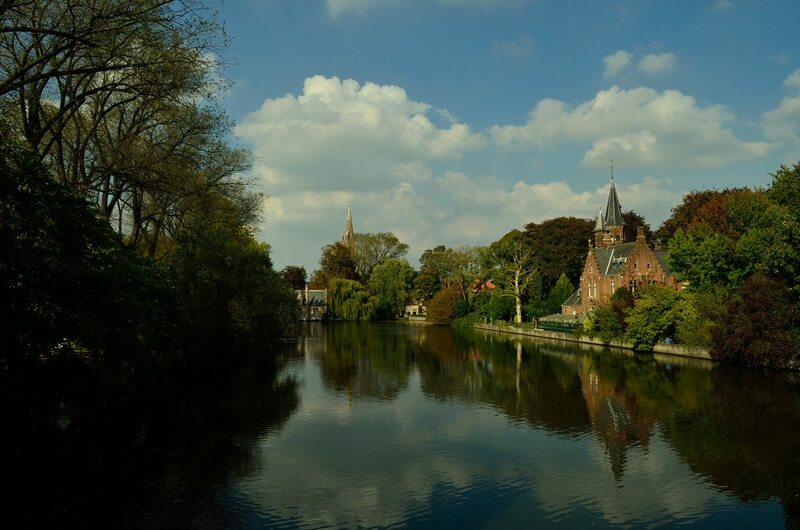 Its so convenient to get to Bruges – just an hour away from Brussels Midi by train and for me , from Citadines Toison D’Or it was just two metro stops away to get to the Midi station. You can combine your trip with Ghent if you plan early as the train passes through the town enroute to Bruges. I started my day a bit late and hence decided to spend the day at Bruges. Another advantage is that if you are travelling on a weekday, and I suggest that you do, as weekends are very crowded, there are two trains an hour and you can plan to head back late night as well. However, a warning…you may not find a seat until Ghent sometimes. It felt quite weird standing in a train for 30 mins, but then you can always choose the next train if its crowded. Get your cameras out. This town is meant for the tourists. Do not be shy of taking selfies and portraits as every part of the town is set in a picture post card setting. With clear blue skies and sparkling waters, my journey was absolutely a visual delight. 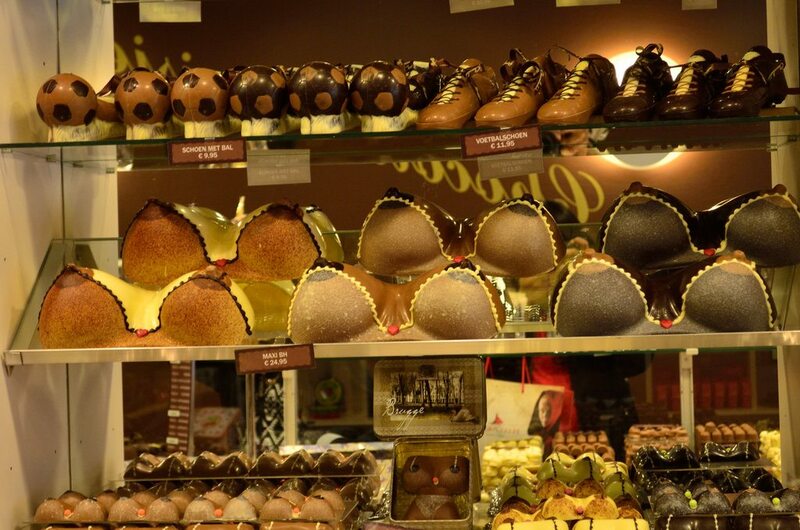 Lakes, monuments, chocolate shops, old homes – every bit of Bruges is worth a picture. The first thing you see when you arrive at the City centre are the horse carriages and you can hear their heavy hoofs trotting on the cobbled streets. They will take you to the old town but it is a bit of a tourist trap. But then if you want to indulge yourself then go ahead and enjoy the medieval setting. Now this is definitely the clincher. 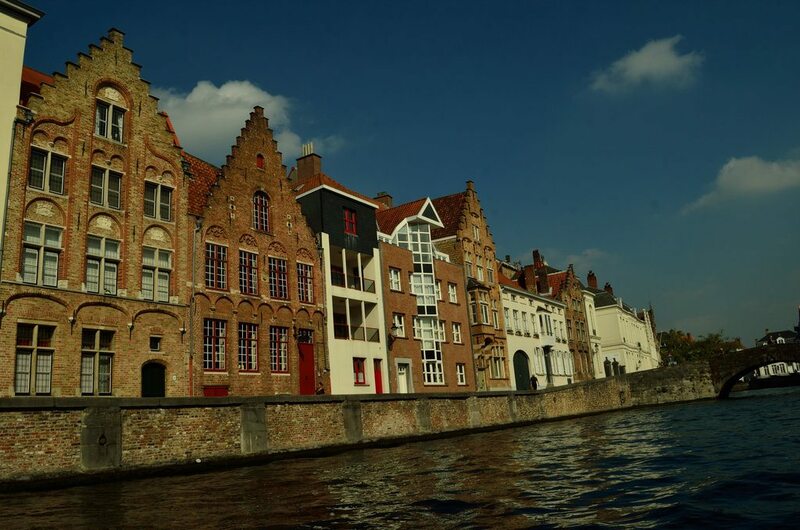 Bruges is a daintier version of Amsterdam and it absolutely oozes charm. Take a 30 minute boat ride around the old town and see the ancient monuments along the canals. Each of them has a story to tell. If you wish, walk again along the same route and watch the swans and ducks swim past you. One of the romantic hot spots is Rozenhoedhaai. It has a sense of timelessness to it. I also liked Groene Rei where the typical Bruges’ scenery with old bridges arching over the waters beckon you. Just walk aimlessly here with no agenda and let the town take over you. Well, if there is a medieval town with canals, then there has to be stories. We heard a few but my favourite was the lake of love near Minnewaterpark called Minnewater or Lake of Love. This is where Minna died in the arms of her beloved, the warrior Stromberg after running away from her father to escape marriage. The tragic story lends a touch of melancholy but there is beauty in the same. As the trees gently touch the waters, the winds blow through them and the lake comes alive. 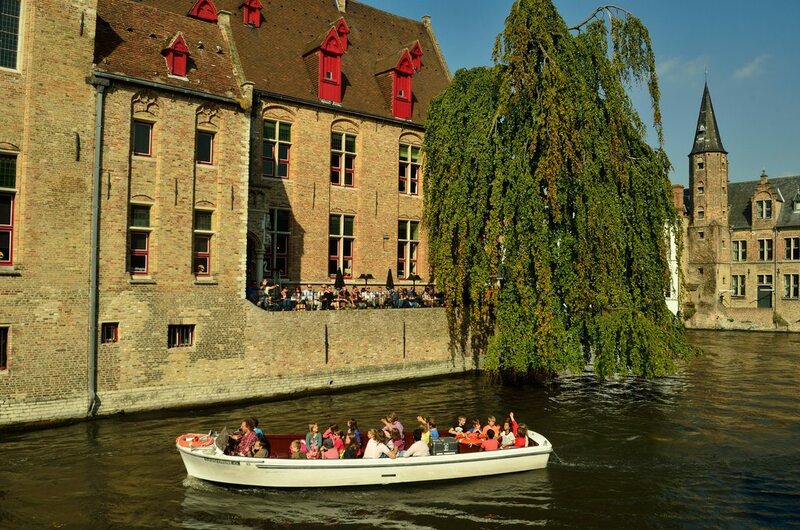 As you cruise along the canals, the swans come to you..It is said that they arrived here in the 15th century and they have become a symbol of Bruges and a permanent fixture in the canals, ironically as a punishment. It is believed that the locals executed an administrator, Pieter Lanchals meaning long neck and made the king, Maxmillan watch it. Although he escaped the rebellion, he apparently passed a decree later that the canals of Bruges should always have swans in them for eternity as the family coat of arms featured a white swan . Sit in a traditional pub or visit a brewery and try the local beers. I tried a dark one with a Lambic blend but the fruit beers were good too. And some day I want to try the trappist beers of the monks. As you get off from the bus at the city centre, you stop right in front of the historium. Catch a show here and dont postpone it like we did, as the last show is at 5 pm. I would strongly recommend it. Saunter around or walk in the park or lean over the old bridges or pose besides a monument or just sit in a restaurant or a pub or a bench by the canals and gaze upon the typical architecture here and watch the world go by. This is probably the best way to spend a few moments in Bruges before heading back to Brussels. I was in Bruges for only one day about 17 years ago and although it looks more touristy in the main square I’m glad to see it’s retained its charm. Your pictures are lovely – I want to get back there some day! Brugge is not to be missed (and much better if you can only see one between Ghent and Brugge). We spent a month in Brugge enjoying the relaxed charm and beauty. I would hate being rushed into only one day but it is certainly better to spend one day in Brugge than none at all. Really great Pics, Amazing Views! Oh my my!!!! Thanks for the mention Lakshmi. It was truly an awesome day well spent with you at Brugge. Just could not have been better. What you have written is just perfect and crisp. Thanks!